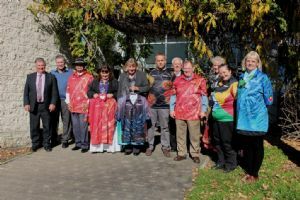 Representatives of the three Aboriginal Land Councils and Bega Valley Shire Councillors have come together to mark the beginning of NAIDOC Week in the Shire with an exchange of special shirts carrying the NAIDOC theme. The National Aborigines and Islanders Day Observance Committee had its origins back in the 1920s when emerging Aboriginal groups sought to increase awareness in the wider community of the status and treatment of Indigenous Australians. Bega Valley Shire Mayor, Michael Britten said the week is a time to celebrate Aboriginal and Torres Strait Islander history, culture and achievements and is an opportunity to recognise the contributions that Indigenous Australians make to our country and our society. He said the theme for NAIDOC 2015 is ‘We all Stand on Sacred Ground: Learn , Respect and Celebrate’ highlighting Aboriginal and Torres Strait Islander people’s strong spiritual and cultural connection to land and sea. “This is a great opportunity to pay respects to Country; honour those who work tirelessly on preserving land, sea and culture and to share the stories of many sites of significance or sacred places with the nation. “In Bega there will be a community fun day on 8 July at the Bega Showground with traditional arts and crafts skills taught by a NPWS Discovery ranger, talks by elders and school students, face and boomerang painting, a barbecue, entertainment by Aboriginal artists and rides for children. “Everyone is welcome,” Cr Britten said. The Bega Valley Regional Gallery will host a NAIDOC Week film festival with screenings at noon on Tuesday, Thursday and Friday 7, 9 and 10 July. Council’s libraries at Eden, Merimbula, Bega and Bermagui have copies of Koori story books that feature the stories of many local Aboriginal people in their own voices. Photograph: from the left is Uncle Ossie Cruse, (representing Eden Local Aboriginal Land Council) Lorraine Naylor (Board Member, Merrimans Local Aboriginal Land Council) Wallaga, Glenn Willcox (CEO, Bega Aboriginal Land Council), Anne Greenaway (CEO, Merrimans Local Aboriginal Lands Council).